Just about every news source in the world featured amazing photos of the Martian landscape earlier this week taken by the Mars rover Curiosity. NASA has sent the $2.5 billion rover to the Red Planet in hopes of getting a better sense of the history of water there and whether the planet could ever have hosted life. 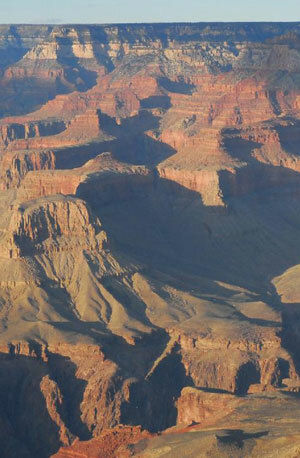 Using its 100mm telephoto lens, Curiosity captured photos of an “intriguing geological ‘unconformity,'” reported BBC News, which may provide more clues about how watery its past was. 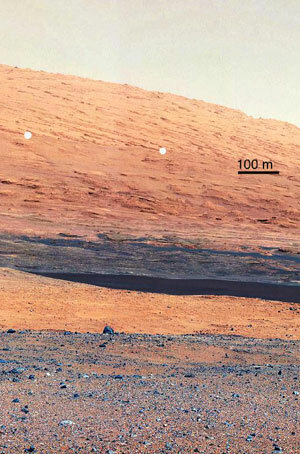 Above we see an image taken by Curiosity’s mast camera, which highlights the geology of 5-km-high Mount Sharp, a mountain that actually sits within the Gale Crater, the spot where Curiosity landed. NASA writes that earlier satellite coverage of the area, below the white dots, indicated the area bears “hydrated minerals,” perhaps the residue of water that once existed on the planet. However, earlier satellite overpasses weren’t able to capture the incline above the white dots, which, interestingly doesn’t contain these minerals. Another shot below shows just how similar parts of Mount Sharp are to the Grand Canyon in the western U.S., which was carved by ancient rivers. The next stop for the rover will be Glenelg (who names these places? ), some 400 meters to the east, which is an “intersection” between different rich geological zones. And now that NASA has gotten Curiosity warmed up, the sturdy, plutonium-powered rover will make its way to the base of Mount Sharp over the course of the next six months or so. 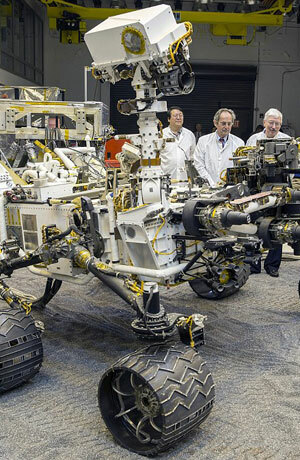 (Interestingly, the rover is powered by plutonium from an old Soviet nuclear weapons plant). At the base of the Mount Sharp, the rover will fire “subatomic particles neutrons at the surface to examine levels of hydrogen- and hydroxyl-containing minerals that could hint at Mars’ prior water-rich history,” writes BBC News. Another tool in its extensive kit is the ChemCam, a laser that will be used to vapourize rocks and then chemically examine the vapour. To get a closer look at the atomic makeup of rocks and soils, Curiosity will scoop up Martian materials and move them to an internalized lab for examination. 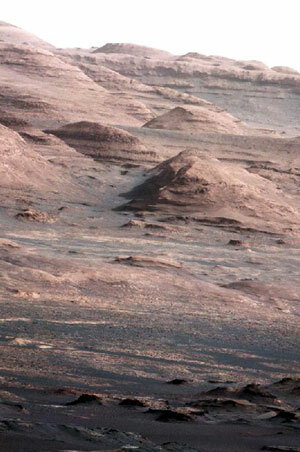 See more images and learn more about what NASA is after in their tour of the Red Planet. 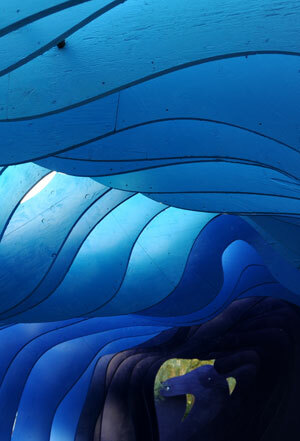 The American Society of Landscape Architects (ASLA) announced the winners of the 2012 Student Awards. More than 450 submissions were received but just 21 student projects were given awards this year in the categories of General Design, Residential Design, Analysis and Planning, Communications, Research, Collaboration and Community Service. 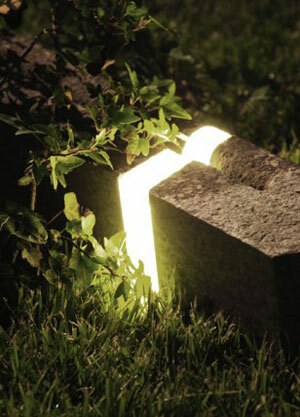 Students will receive their honors on October 1, at the 2012 ASLA Annual Meeting and EXPO in Phoenix, Arizona. 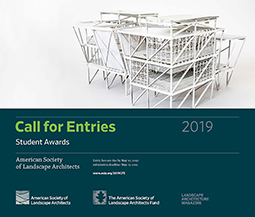 The student awards jury included: David Yocca, FASLA, Chair; Sheila A. Brady, FASLA; Mark A. Focht, FASLA; M. Paul Friedberg, FASLA; Paul H. Gobster, FASLA; Debra Guenther, ASLA; Linda Jewell, FASLA; Chris Reed, ASLA; and Andrew Wilcox, ASLA. The September issue of Landscape Architecture Magazine (LAM) features the winning projects and is available online for free viewing. September’s LAM will also be featured on the endcap of the magazine section in nearly 500 Barnes & Noble stores beginning September 14. 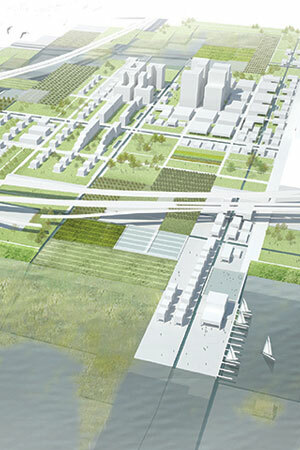 For the complete list of winners, please explore the 2012 ASLA Student Awards Web site. 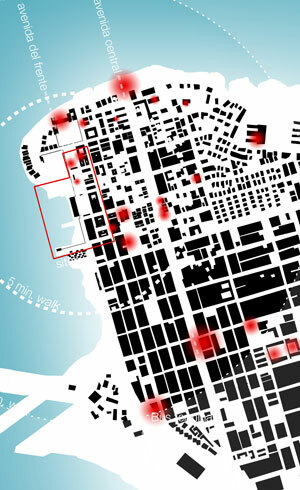 Image credits: (1) Colón: Collective Strategies for a Regenerative Waterfront, Carolina A. Jaimes, Assoc. 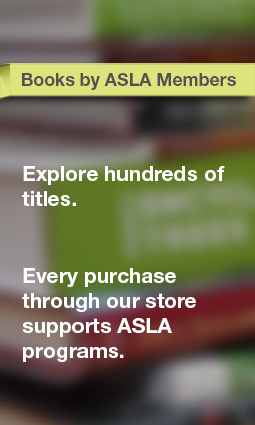 ASLA, (2) Operative Platform. Hansol Kang, Student ASLA, (3) (4) Tim Trumble and Anna Christy, (3) Mining as Demining. Xiaoxuan Lu, Student ASLA, (4) Peritoneum. Anna Christy, Student ASLA; Kyle Fiano, Student ASLA and Erica Mackenzie, Assoc. ASLA. 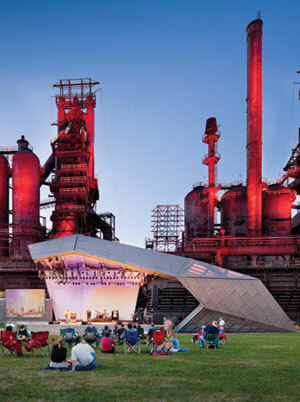 The American Society of Landscape Architects (ASLA) announced the winners of the 2012 Professional Awards. 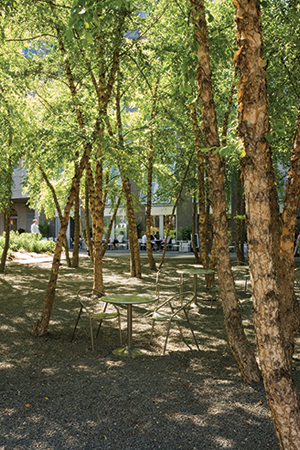 The awards honor the top public places, residential designs, campuses, parks and urban planning projects from across the U.S. and around the world. 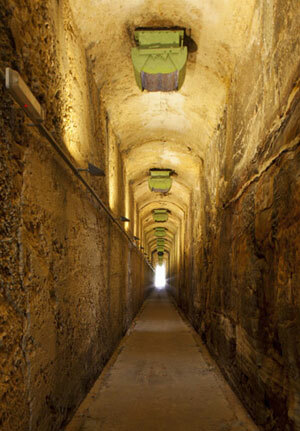 High-resolution images and full project information can be viewed online. 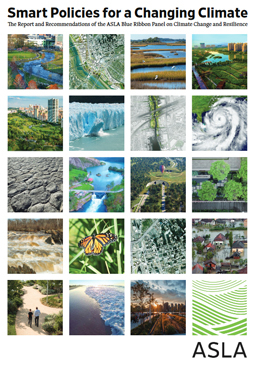 ASLA will present 37 awards to professional landscape architects and their firms, selected from more than 620 entries in the categories of General Design, Residential Design, Analysis and Planning, Communications, and Research. In addition, The Landmark Award recognizes a distinguished landscape architecture project completed between 15 and 50 years ago that retains its original design integrity and contributes to the public realm of its community. This year, the professional awards jury included: José Almiñana, FASLA, Chair; Stephen T. Ayers, FAIA; Gail Brinkmann, ASLA; Kathryn L. Gleason, FASLA; Mikyoung Kim, ASLA; Tom Leader, ASLA; Thomas R. Oslund, FASLA; and Jim Schuessler, ASLA. The September issue of Landscape Architecture Magazine (LAM) features the winning projects and is available online for free viewing. September’s LAM will also be featured on the endcap of the magazine section in nearly 500 Barnes & Noble stores beginning September 14. 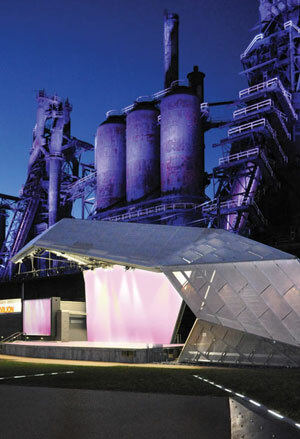 Winners will be announced at the ASLA Annual Meeting and EXPO in Phoenix on Monday, October 1. By Claude Cormier + Associés, Inc.
Arizona State University Polytechnic Campus – New Academic Complex, Mesa, Ariz.
By Ten Eyck Landscape Architects, Inc.
Sunnylands Center & Gardens, Rancho Mirage, Calif.
Quaker Smith Point Residence, Shelburne, Vt.
New-Century Garden: A Garden of Water and Light, Palm Springs, Calif. Maple Hill Residence, Westwood, Mass. Reordering Old Quarry, Guilford, Conn.
By West 8 Urban Design & Landscape Architecture, P.C. SW Montgomery Green Street: Connecting the West Hills to the Willamette River, Portland, Ore.
Red Mountain / Green Ribbon: Linking Across Birmingham’s Great Divide, Birmingham, Ala.
By Sharon Gamson Danks, ASLA, Bay Tree Design, Inc.
By Ken Smith Landscape Architect and Schwartz Smith Meyer Landscape Architects, Inc. 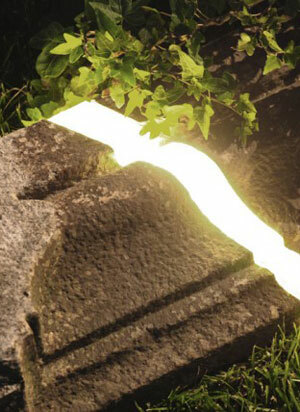 Explore all the ASLA 2012 Professional Award winners. 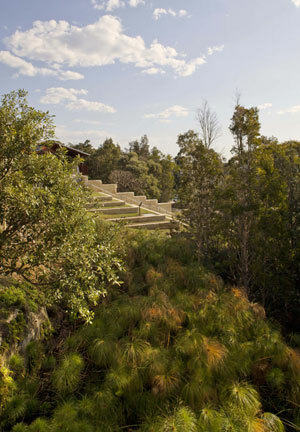 Image credits: (1) ASLA 2012 Professional General Design Award of Excellence. 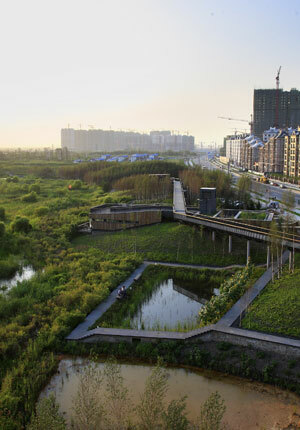 A Green Sponge for a Water-Resilient City: Qunli Stormwater Park, Haerbin City, Heilongjiang Province, China. 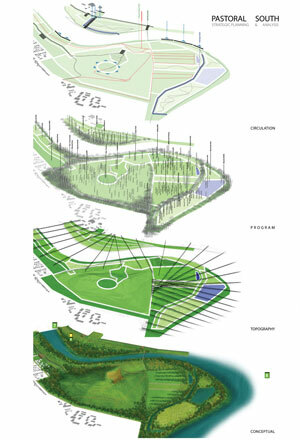 Turenscape and Peking University, Beijing / Yu Kongjian, (2) ASLA 2012 Professional Residential Award of Excellence. Drs. Julian and Raye Richardson Apartments, San Francisco. Andrea Cochran Landscape Architecture, San Francisco / Bruce Damont, (3) ASLA 2012 Professional Analysis and Planning Award of Excellence. The One Ohio State Framework Plan, Columbus, OH. Sasaki Associates, Inc., Watertown, MA / Sasaki Associates, (4) ASLA 2012 Communications Award of Excellence. 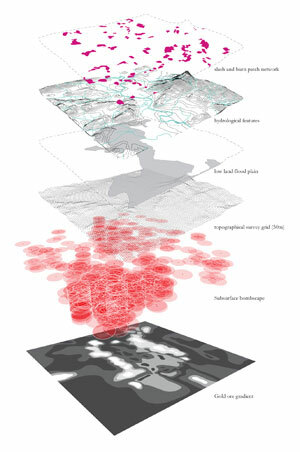 Digital Drawing for Landscape Architecture: Contemporary Techniques and Tools for Digital Representation in Site Design. Bradley Cantrell, ASLA and Wes Michaels, ASLA. 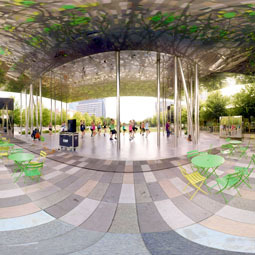 Publisher: John Wiley & Sons, Inc., (5)ASLA Landmark Award. Village of Yorkville Park, Toronto. Ken Smith Landscape Architect, New York City, Landscape Architect of Record: Schwartz Smith Meyer Landscape Architects, Inc. / Peter Mauss/ESTO. 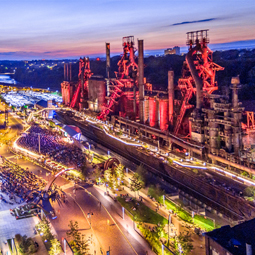 Landscape architects are increasingly recognized as the most critical designers of post-industrial sites, perhaps the only ones capable of transforming abandoned and often toxic industrial infrastructure into vibrant new parks and event spaces that also show a deep respect for the past. 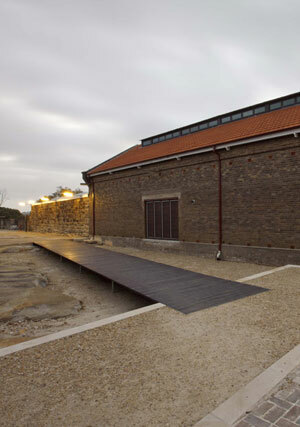 Like the ASLA award-winning Steel Yard Park in Providence, Rhode Island, or the Paddington Reservoir Gardens Park in Sydney, Australia, these three new projects from around the world, each with very different vibes, show how the bar is constantly being raised as landscape architects transform beautiful ruins into exemplars of public design. 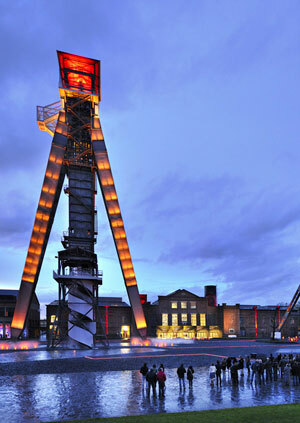 In Genk, Belgium, Hosper Landscape Architecture and Urban Design created C-M!ne square, a new cultural center on the site of a former coal mine, writes Landezine. 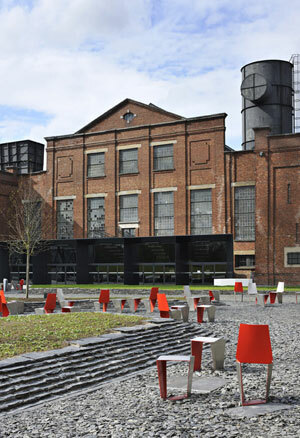 Forming a “spectacular” open space, the square also plays host to revamped former industrial buildings, a new theatre, cinema, restaurants, and Genk design academy. Hosper’s team design writes: “An obstacle-free surface ensures that the square can be used for a wide variety of purposes.” Anticipating both heavy use and just a few pedestrians, the square is paved with “black slate slabs,” set with different sizes and laid in an informal pattern. 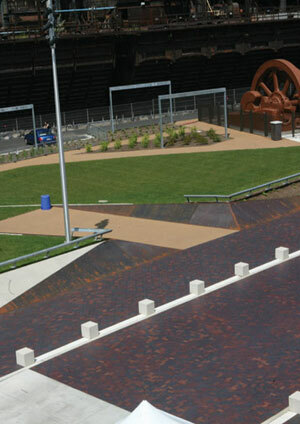 The black slate seen below is a visual reference to the “black gold,” the coal dug up from the mines. 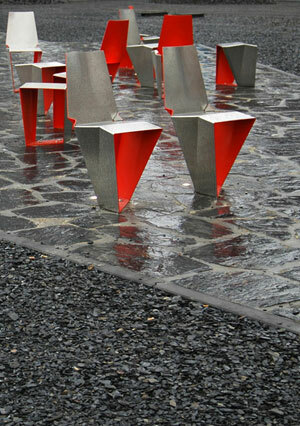 Together with the lighting, which is embedded into zig-zagging paths within the pavement in some places (see image at very top), the custom-designed, removable chairs and stools made of stainless steel plate “glitter like diamonds” among the coal-black pavement. The chairs are red so they have a warm glow at night. Across the globe on the Waverton Peninsula in North Sydney, Australia, landscape architecture firm Hassell led a huge team that also transformed a coal mine, this time the Coal Loader and Caltex industrial site, into parkland. Decommissioned in the early 1990s, the site had been vacant for more than 40 years by then. The site used to be a “bunkering and distribution point” since the early 1900s, and then used to store oil throught the 1950s. Like C-M!ne square, the Coal Loader, as the site is now called, now hosts a range of festivals and private events, offers new office space and cafe. To showcase how sustainable adapative reuse of old industrial infrastructure can be, there’s a new sustainability learning center in the old caretaker’s cottage. 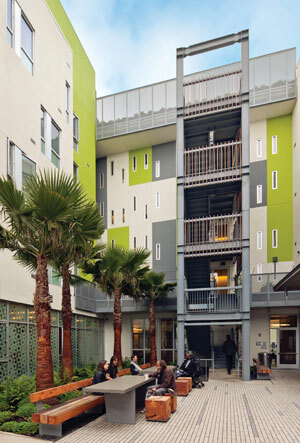 The sustainability center is also there to teach visitors about all the sustainable design practices used. Hassell writes that best practices like “water harvesting, treatment and re-use, waste water treatment, energy capture and storage, community gardening and the use of recycled materials” were incorporated. The new “asymetric and cantilevered” addition — the Levitt pavilion — was designed to provide a vivid contrast to the plant in the background. Image credits: (1) C-M!ne / Hosper, Pieter Kers, (4-6) The Coal Loader / Simon Wood, (7-8) Bethelem Steel Plant / Paul Worcher, (9) The Architect’s Newspaper. 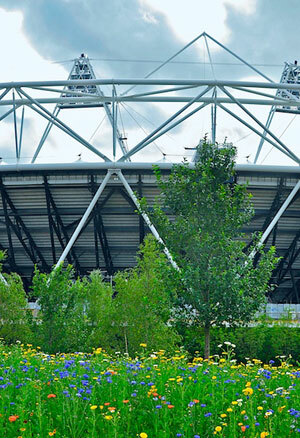 While the architecture of the London Olympic games certainly won the U.K. a lot of press, there seemed to be a real dearth of coverage on the Games’ highly successful landscape architecture. Nearly 250 acres were turned into a spectacular setting. According to John King, Hon. ASLA, architecture critic for The San Francisco Chronicle, that success was due to a team of landscape architecture firms, including U.K.-based LDA Design and U.S.-based landscape architecture firm, Hargreaves Associates, who came in at the proverbial last minute to update the master plan in key spots, along with English planting designers Nigel Dunnett, Sarah Price, and James Hitchmough. 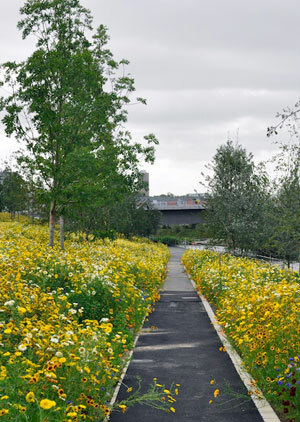 Working with LDA Design, Hargreaves changed the planned river, creating “wider and more natural banks,” which were then cloaked in a sea of greenery, including a wildflower meadow planted by Dunnett and his colleagues. 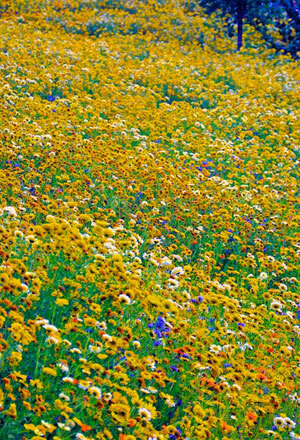 (The meadow, an iconic English landscape, is said to be the largest ever planted in the U.K). Also, King reports, the plazas in the master plan were reduced in size in order to create space for new hillocks, or what Hargreaves called “sculptural tectonic forms.” These hillocks provide a platform for visitors to see the city, beyond the Olympic Village, and also help create a “softening” of the transition from the busy avenues packed with throngs of visitors. 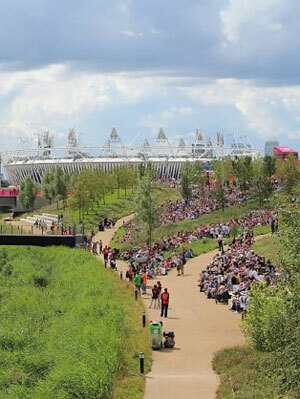 The London Olympics just ended with a bang so the landscape will now become public parkland. 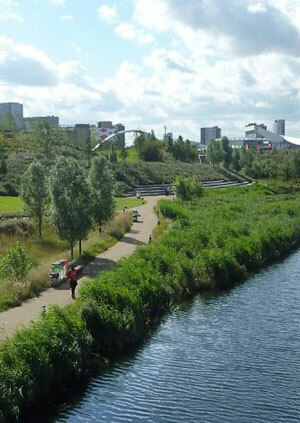 According to LDA, the park will be expanded, reopening as the Queen Elizabeth Olympic Park in 2014. A 55-acre piece of that bonanza of a project will go to who else but James Corner Field Operations, designers of the High Line and winners of the Chicago Pier design competition. 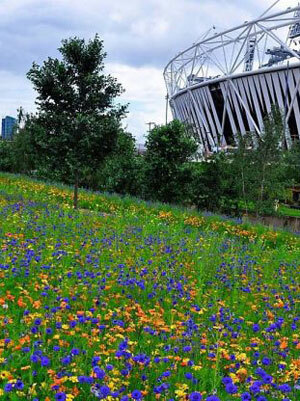 See lots more photos of the Olympic landscape. 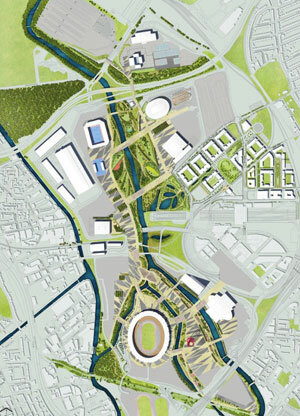 Image credits: (1) Nigel Dunnett, (2) Andy Harris, Hargreaves Associates, (3-4) Nigel Dunnett, (5) Peter Neal, Hargreaves Associates, (6) Master plan concept, LDA Design, Nigel Dunnett, Hargreaves Associates, (7-8) Nigel Dunnett. The worst drought in a half a century has already caused billions of dollars of losses for farmers and communities. In parts of the country where water has long been conserved, like the west, lawn painting has unfortunately long been seen as a solution. Now, with water being conserved across the country like never before, what are all those homeowners with lawns supposed to do? 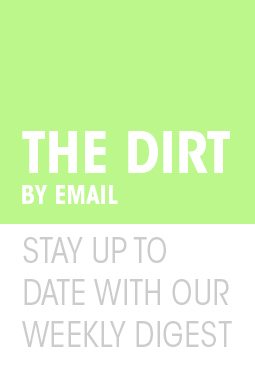 Instead of replacing lawns with native plants that require little water (otherwise known as xeriscaping), more may be throwing away money trying to paint their way to a lush, verdant lawn. Many landscape architects may shake their head at such a move, but at a cost of $125 to paint her 830-square-foot-lawn, it’s certainly cheaper than ripping out the lawn and replacing with native alternatives that don’t require much water or creating a new, usable outdoor space. Indeed, these cheap and fast approaches have yielded more business for the owner of the Staten Island company, Grass Is Greener Lawn Painting. The owner told AP that he has already painted 20 lawns this summer. The dye used is a “non-toxic, environmentally friendly turf dye that […] is commonly used on golf courses and athletic fields to give them a lusher appearance.” Just to note: There really isn’t such a thing as an environmentally-friendly dye given the huge amount of water that actually goes into producing dyes. Also, much like a spray-on tan, the green lawn look doesn’t hold forever. 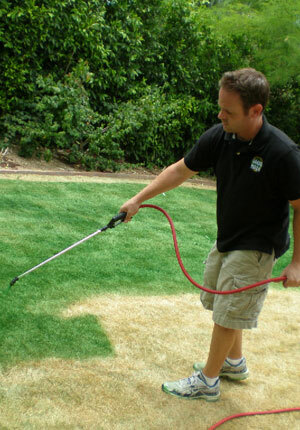 In about five months, homeowners going the non-natural way will need a fresh spray. The AP then examined the practice in the Midwest, looking to Kansas City, Mo.-based Missouri Turf Paint Inc. The company has been painting golf courses and athletic fields for years, but has seen an uptick in residential spraying. Foreclosed homes are often sprayed, the owner said, to boost resale prospects. Howland charges $200 for up to 3,000 square feet. Clearly more work needs to be done to convince homeowners everywhere that there are smart alternatives to lawns, like xeriscaping. 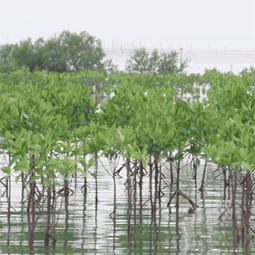 With climate change, drought-like conditions may not be going away anytime soon. One sustainable landscape case study shows how much cheaper a native residential landscape is to maintain over time. Also, explore ASLA’s guides to sustainable residential design: improving water efficiency, and its connected guide on maximizing the benefits of plants. 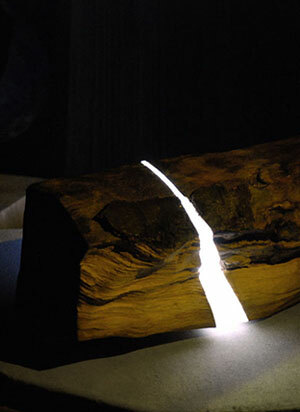 Italian designer Marco Stefanelli is breathing new life into old pieces of wood and stone for his Brecce collection of sustainable indoor and outdoor lighting. 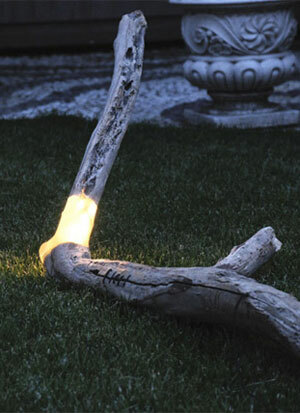 Cast-off sawmill byproducts, left-over firewood, or broken concrete building parts are embedded with resin and long-lasting LEDs so they glow from within. 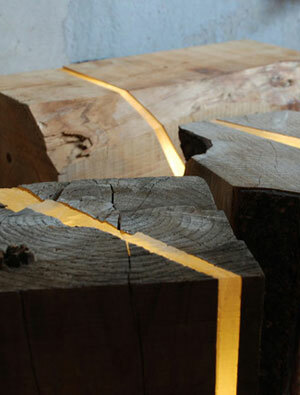 For his pieces, the “formwork” is made of wood or stone but divided into multiple segments. 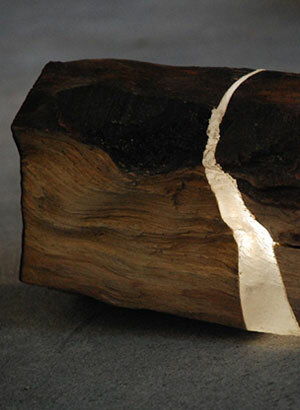 Resin is the middle layer that keeps the work together. See more images at This is Colossal. In the past few years, the massive, 22-hectare Barangaroo redevelopment project on Sydney’s iconic harbour has been mired in controversy. First, an international competition was announced in 2006, which was won by Hills Thalis Architecture. Then, upon concerns about the transparency of the development process and that the project was out of scale with the surrounding Sydney Harbour, a new competition was launched a few years later, which was then won by starchitect Sir Richard Rogers. 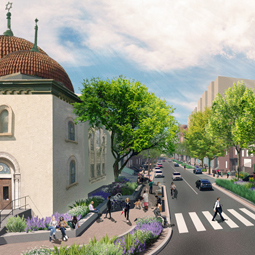 In those years, the scope of the project also changed to improve the commercial viability of the A$ 6 billion project. The amount of space dedicated to commercial use was increased by one-third. To accomodate all the expected business influx, Rogers, controversially, proposed a nearly 800-feet-tall hotel among the parks and commercial offices. Rogers defends his approach as appropriate for the massive scale of the development. 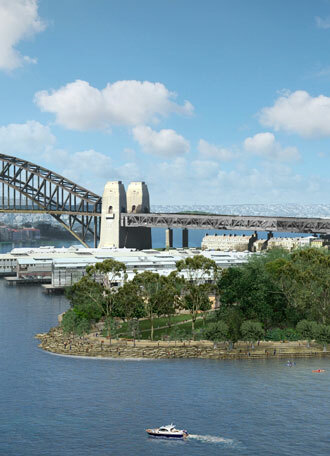 The site is divided into three segments: Barangaroo South, Headland Park, and Barangaroo Central. Barangaroo South is home to Rogers’ three skyscrapers, including the 800-feet-tall hotel, while Headland Park, a 6-hectare site, will be designed by Australian architecture firm Johnson Pilton Walker in association with U.S. landscape architecture firm Peter Walker and Partners. The park is expected to include 100 percent native “common” plant species growing on recycled water. Interestingly, prior to the announcement of the final designs, famed urban designer Jan Gehl said, due to the size of parkland, it can’t be anything but “a wasteland” and “fearful at night.” Given the park won’t be completed until 2015 and the other sites won’t come online for a few years after that, it will take some time to see if he’s proved to be correct. Now, according to the Barangaroo Development Authority, an international competition is underway for Barangaroo’s 5.2-hectare central district. The development authority, which has been the subject of its own controversy — with a few of its members removed by the city for conflicts of interest, will be seeking world-class master planning services from a landscape architecture, urban design, or planning firm. On the upside, the project plans to be the first major climate positive development in Australia. However, on the other hand, according to The Sydney Morning Herald, the developers are already talking about creating a huge casino in the new central district, making any plans that don’t include a spot for gambling moot from the get-go. 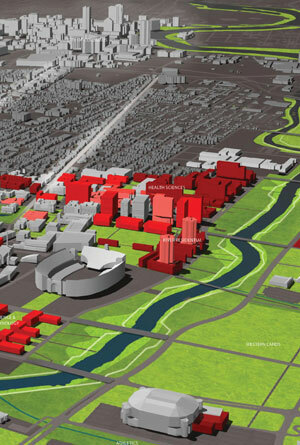 The successful team will create a conceptual vision while revising the existing concept plan, along with a new master plan, land use framework, and public domain plan. 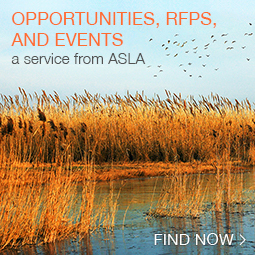 Beginning at the end of August, firms can find the RFP online. Submissions must be in by September 26, 2012. A new research study by Professor Thomas Pugh at Lancaster University and other scientists in the UK has found that adding trees, bushes, innovative systems like green walls, or even ivy or other creeping vines, can cut street-level nitrogen dioxide (NO2) and microscopic particulate matter (PM), two of the worst forms of pollution, by eight times more than previously thought. Many urban streets have high levels of these types of pollution, far exceeding healthy amounts for humans. 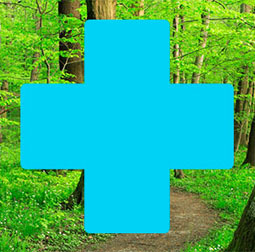 According to Science Daily, previous research has said trees and other greenery can only improve urban air quality by around 5 percent. ASLA’s recent animation on the positive impact of urban forests on air pollution used U.S. Environmental Protection Agency and National Park Service-cited results, which pointed to around 10-13 percent improvement in air quality from major increases in urban greenery. 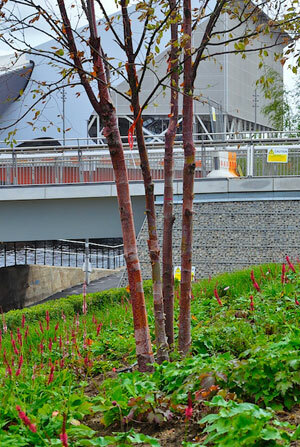 To ensure these systems work, Pugh also mentioned to the BBC that “more care needs to be taken as to how and where we plant vegetation.” Street trees, which have up to a 30 percent mortality rate in big cities like New York City, need better treatment if they are going to work effectively as filters. 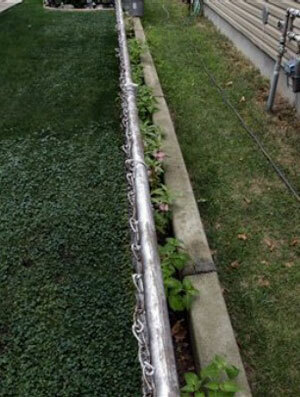 In the same way, green walls need to be protected from heat stress and a lack of water. Beyond these issues, others in the UK debated the value of green walls for addressing air pollution on a cost basis. 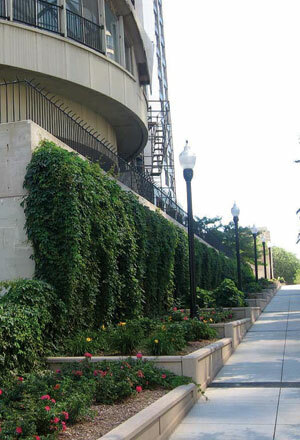 Given the higher maintenance costs associated with elaborate installed green wall systems, the Trees and Design Action Group wondered whether ivy or other creeping vines weren’t easier and cheaper to use. We’d just add that any comparison between green walls and ivy should also examine the stormwater management, urban heat island effect, and noise reduction benefits of both approaches, too. So this is probably the world’s classiest outdoor Wi-Fi hotspot. 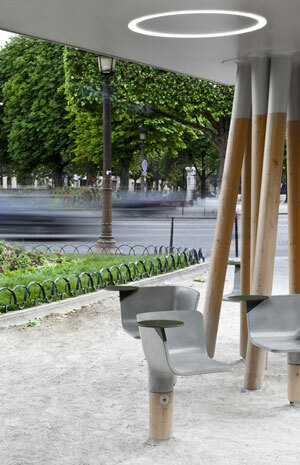 A new project in Paris by French designer Mathieu Lehanneur, who has done innovative, sustainably designed products, and JCDecaux, a British firm said to have invented the idea of embedding advertising in outdoor furniture, got lots of attention from the major design blogs a few months back and just last week The New York Times’ “Home” section also picked up the trail. 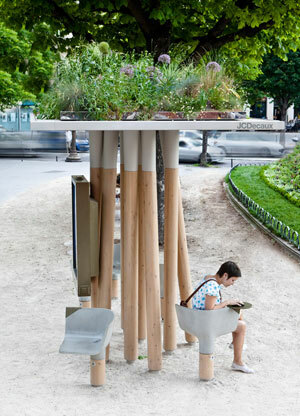 Called Escale Numérique (or Digital Break), the new Wi-Fi hotspot is a green-roofed pit-stop at the busy corner of Rond-Point des Champs-Elysées, a few blocks from the Grand Palais, writes Urban Gardens. Inspired by the Wallace fountains, “which since the end of the 19th century, have offered Parisians the free drinking water circulating beneath their feet, Escale Numérique allows everyone to benefit from a high-speed Wi-Fi connection by raising it from beneath the ground,” said Lehanneur, in comments to that Web site. 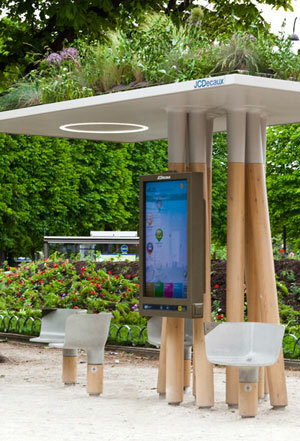 The new piece of urban infrastructure comes with a large multimedia touch screen that provides maps, guides to city services, and local news, along with free Wi-Fi. 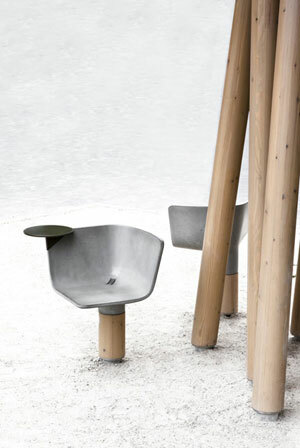 Just the beautifully-sculpted yet sturdy-looking concrete swivel seats may be worth a visit alone. 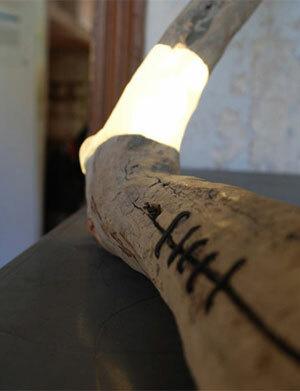 These have built-in electrical outlets for a quick laptop or phone charge and mini-tables to rest weary elbows. The New York Times writes that they profiled Lehanneur because he’s seems so unlike the usual designer interested in creating yet another high-end chair. Lehanneur is well-known in the product design world for creating smart sustainable products like a household air purification system using plants and a small tank to raise fish and vegetables that can fit into an average kitchen. Increasingly, he’s also interested in designing for the public realm, with new chess player tables and urban infrastructure for skaters in the works.